Canis lupus (the dog) is possibly the first animal to have been domesticated by humans. It has been selectively bred into a wide range of different forms. They are found throughout the world in many different habitats, both closely associated with humans and away from habitation. They are active hunters and have significant negative impacts on a wide range of native fauna. Domestic dogs are believed to have first diverged from wolves around 100,000 years ago. Around 15,000 years ago dogs started diverging into the multitude of different breeds known today. This divergence was possibly triggered by humans changing from a nomadic, hunting based-lifestyle to a more settled, agriculture-based way of life (Vilà et al. 1997). 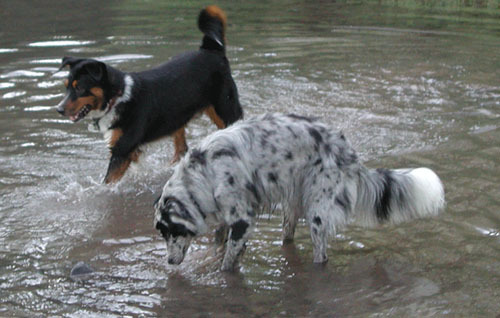 Domestic dogs have been selectively bred for various behaviours, sensory capabilities and physical attributes, including dogs bred for herding livestock (collies, shepherds, etc. ), different kinds of hunting (pointers, hounds, etc. ), catching rats (small terriers), guarding (mastiffs, chows), helping fishermen with nets (Newfoundlands, poodles), pulling loads (huskies, St. Bernards), guarding carriages and horsemen (Dalmatians), and as companion dogs. Domestic dogs are therefore extremely variable but the basic morphology is that of the grey wolf, the wild ancestor of all domestic dog breeds. Dogs were possibly the first animal to be domesticated by humans around 15,000 years ago. There are estimated to be 400,000,000 dogs present in the world. Dogs taken to the Pacific islands by the early Polynesians may have been about the size of a small collie, but shorter in the leg (Anderson 1990). They have long since been replaced by, or crossed with, various breeds from Europe. Reviewed by Mech (1974, Mammalian Species, 37) Canis familiaris has page priority over Canis lupus in Linnaeus (1758), but both were published simultaneously, and C. lupus has been universally used for this species [excerpted from Mammal Species of the World, 3d Edition, p. 281] (ITIS, 2004). Domesticated dogs have been bred to assist humans in a wide range of activites including farming, hunting and companionship. Dogs are usually closely associated with humans so can potentially be found in all habitats. Feral and ranging domestic dogs may be found far from human habitation. Placental, sexual. 4-12 puppies per litter. Both males and females become sexually mature at around 6-12 months. Recommended citation: Global Invasive Species Database (2019) Species profile: Canis lupus. Downloaded from http://www.iucngisd.org/gisd/species.php?sc=146 on 21-04-2019. In Israel, free-ranging feral dogs are a major threat to populations of endangered mountain gazelles (see Gazella gazella ssp. gazella in IUCN Red List of Threatened Species) (Manor and Salz, 2004). Canine Distemper Virus (CDV) is thought to have caused several fatal epidemics within the Serengeti-Mara ecosystem in East Africa. The source of the CDV was probably domestic dogs in the local villages surrounding the park. The canids affected included silver-backed jackals (Canis mmesomelas) and bat-eared foxes (Otocyon megalotis) in 1978 and endangered African wild dogs (see Lycaon pictus in IUCN Red List of Threatened Species) in 1991. The Serengeti lion population (see Panthera leo in IUCN Red List of Threatened Species) which remained unaffected during these two epidemics was hit by an epidemic in early 1994, caused by a morbillivirus which is closely related to CDV. Later that year the epidemic had spread north to lions, hyenas, bat-eared foxes and leopards in the Maasi Mara National reserve. This epidemic claimed at least 30% of the lion population (estimated at 3000 in Serengeti at that time). It is suggested that the possible route of transmission from domestic dogs was the spotted hyena that range through human habitation and travel long distances within the park (Roelke-Parker et al. 1996). Uncontrolled domestic dogs can be equally as damaging as truly feral animals. In New Zealand, during study of kiwi (see Apteryx australis; Apteryx haastii; Apteryx mantelli; and Apteryx owenii in IUCN Red List of Threatened Species) in a Northland forest, the loss of 13 out of 23 kiwi fitted with transmitters was found to be the result of predation by one German shepherd dog. It was estimated that this single dog alone had killed 500 out of 900 birds, although this estimate was considered to be possibly conservative (Taborsky 1988). Seabirds and mammals are included among the prey taken by feral dogs (e.g. Dickman, 1996, Stevenson and Woelher, 2007). The principal techniques to control wild dogs are exclusion fencing, shooting, trapping and poisoning. Poisoning using 1080 is the most cost-effective means of reducing populations of wild dogs over large areas of remote or inaccessible country. New techniques such as the use of livestock guarding dogs, poison ejecting devices and toxic collars have been suggested as alternatives to current methods. The Australian Bureau of Rural Sciences (BRS) in cooperation with the Vertebrate Pests Committee of the Standing Committee on Agriculture and Resource Management (SCARM) has published guidelines for managing the impacts\r\nof dingoes (Canis lupus dingo) and other wild dogs (C.l. familiaris) as part of the Managing Vertebrate Pests series. Please follow this link to view and download Fleming, P., Corbett, L., Harden, R. and Thomson, P. (2001) Managing the Impacts of Dingoes and Other Wild Dogs. Bureau of Rural Sciences, Canberra. Informations on Canis lupus has been recorded for the following locations. Click on the name for additional informations. Fleming, P., Corbett, L., Harden, R. and Thomson, P. 2001. Managing the Impacts of Dingoes and Other Wild Dogs. Bureau of Rural Sciences, Canberra. Gerber, G. 1997. Nesting Behavior of the Little Cayman rock iguana, Cyclura nubila caymanensis. Joint Annual Meeting, American Society of Ichthyologists and Herpetologists/Herpetologists League/Society for the Study of Amphibians and Reptiles. University of Washington, Seattle, U.S.A.
Summary: The Bureau of Rural Sciences National Feral Animal Control Program under the Natural Heritage Trust has supported the Pest Animal Control CRC in cooperation with the University of Canberra to develop a comprehensive, interactive and freely available website, Feral.org.au on pest animals. The site aims to make information on past and current research readily accessible and to interpret and pull together relevant data to assist end-users in making management decisions. Anderson, A. J. 1990. Kuri. In King, C. M. (ed.) The Handbook of New Zealand Mammals. Oxford University Press, Auckland: 281�287. Barnett, B. D. 1982. Feral dogs of southern Isabela. Noticias Galapagos 35: 15�16. BirdLife International 2004. Apteryx australis. In: IUCN 2007. 2007 IUCN Red List of Threatened Species. BirdLife International 2004. Apteryx haastii. In: IUCN 2007. 2007 IUCN Red List of Threatened Species. Summary: Personal communication with Benoit de Thoisy from the association Kwata , an expert of the vertebrate fauna of french Guiana. Hawkins, A.F.A. 2008a. Fossa fossana. In: IUCN 2011. IUCN Red List of Threatened Species. Version 2011.2. Hawkins, A.F.A. 2008c. Galidictis fasciata. In: IUCN 2011. IUCN Red List of Threatened Species. Version 2011.2. Hunt, G.R., Hay R., Veltman, C. 1996. Multiple kagu Rhynochetos jubatus deaths caused by dogs attacks at a high altitude site on Pic Ningua, New Caledonia. International Bird Conservation, 6 : 295-306. Manor, M. and Saltz, D. 2004. The impact of free-roaming dogs on gazelle kid/female ratio in a fragmented area. Biologocal Conservation 119:231-236. Mus�um national d Histoire naturelle [Ed]. 2003-2006 . Canis familiaris. Inventaire national du Patrimoine naturel, site Web : http://inpn.mnhn.fr. Document t�l�charg� le 28 mars 2008 . Taborsky, M. 1988. Kiwis and dog predation: observations in Waitangi State Forest. Notornis 35: 197�202.